How do I get to the Ignition cylinder to change it. I have the steering wheel off and ran into a part I can't get off. It was sfter I got the cover off holding the turn signal, then there is another cover showing some bearings in the front. Important: Steering column must be removed from car before proceeding with the following steps. 2. Pull tilt lever (30) and tilt column all the way up. 3. Insert phillips head screwdriver into square opening in spring retainer (11), push down and turn left to release retainer (11) and wheel tilt spring (12). 4. Spring retainer (11), tilt spring (12) and tilt spring guide (13). 5. Two lower spring retainers (28) and discard. 6. Lower bearing spring (27) and lower bearing seat (26). 8. Adapter and lower bearing assembly (24). 9. Two pivot pins (10) with J 21854-01 as shown. 10. Place lock cylinder (20) in "Run" position. 11. Pull tilt lever (30) to release shaft and housing assembly (9). 12. Shaft and housing assembly (9) from jacket and bowl assembly (19). 13. Place lock cylinder (20) in "Off-Lock" position and remove key. 14. Buzzer switch (17). Use screwdriver to lift switch tab and pull gently on wires to remove. 15. Lock retaining screw (18). 17. Column tilt bumpers (31) with vise grips. If bumper is broken off use a 5.9 mm (7/32 in.) drill to remove remaining piece of bumper. 18. Tilt bracket screws (29). 19. Tilt lever and bracket assembly (30). 20. Rod cap (32) from dimmer switch rod (35). 21. Jacket and bowl assembly (19). Important: All fasteners in the following steps must be firmly seated before being tightened to specified torque. 1. Rod cap (32) into jacket and bowl assembly (19). 2. Tilt lever and bracket assembly (30) into jacket and bowl assembly (19). 3. Tilt bracket screws (29) and torque to 5.2 Nm (46 lb. in.). 4. Three tilt bumpers (31) into jacket and bowl assembly (19) until bottomed. 5. Steering column lock cylinder set (20) in "Off- Lock" position with key removed. 6. Lock retaining screw (18) and torque to 7.0 Nm (62 lb. in.). 7. Buzzer switch assembly (17). Push switch down into retaining bore until bottomed with plastic tab covering lock retaining screw (18). 8. Insert key and place lock cylinder (20) in "Run" position. 9. Shaft and housing assembly (9). 10. Lubricate pivot pins (10) with lithium grease. - Two pivot pins (10) into pivot holes in shaft and housing assembly (9) until bottomed. 11. Pull tilt lever (30) and tilt column all the way up. 12. Lubricate tilt spring guide (13) with lithium grease. - Tilt spring guide (13) into tilt spring (12). 13. Guide (13) and tilt spring (12) with spring retainer (11) as follows: - Be sure that recess in spring guide (13) engages round locating tab in jacket and bowl assembly (19). - Insert phillips head screwdriver into square opening in spring retainer (11), push down and turn right to lock in place. 14. Adapter and lower bearing assembly (24). 15. Adapter screws (25) and torque to 3 Nm (26 lb. in.). 16. Lower bearing seat (26) and lower bearing spring (27). 17. Two new lower spring retainers (28), compress spring (27) until retainers are positioned 29 mm (1.14 in.) from lower end of steering shaft. 18. 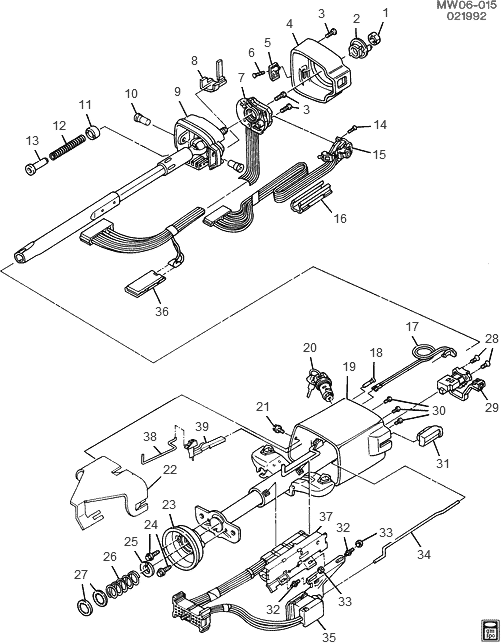 Steering Column in car. 19. Park lock cable into ignition switch inhibitor and snap in place.